Schutz American School has a rich 90+ year tradition of providing a challenging American-based educational program, in English, for students ages 3-18 in Alexandria. “Schutz is family,” their motto, has characterized SAS since its beginning in 1924. 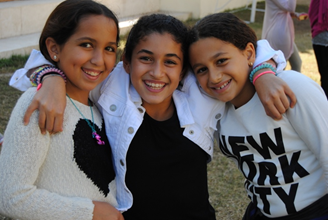 The school serves over 325 students from both Egyptian and international families. Their commitment is to provide students a well-rounded college preparatory program to develop their full intellectual, emotional, physical and social potential. As a non-sectarian day school, Schutz offers enrollment to students who are seeking an American-based international education and demonstrate the ability to access and benefit from their challenging academic program. The school follows U.S. Common Core Standards and offers the Advanced Placement (AP) program providing the opportunity for their graduates to attend the finest colleges and universities around the world. With continued annual enrollment growth at the pre-school level, the school is expected to have two classes at all grades within the next ten years. There are currently two classes per grade level from Pre-K3 through Grade Three and at Grade Seven and one class in all other grades. Class sizes average between fourteen to sixteen students. The school is a non-profit organization governed by a 12 member, self-perpetuating Board of Trustees. It is accredited by the New England Association of Schools and Colleges (NEASC) and the Council of International Schools (CIS) and received its most recent ten-year reaccreditation in January 2014. Most new families are curious about the name - Schutz. Peter Schutz was a wealthy Dutch merchant who lived in an area of Alexandria in the last part of the nineteenth century. When the tram line was built, he donated some of his land for the line. As a result the tram stop nearest the school is called Schutz. The neighborhood around the stop became known as Schutz, and the street leading to the school was named Schutz Street. Hence the name: Schutz American School. The mission of Schutz American School family is to empower all of our students with the knowledge, skills, and confidence to fulfill their life-long aspiration and to act to better their communities. At Schutz American School we believe the education we provide will give our culturally diverse student body the means to grow intellectually, emotionally, physically and socially. We believe in maintaining the sense of family and community that make Schutz an understanding, cooperative and healthy learning environment. Family is foundational for shaping the individual. Each individual has immeasurable intrinsic worth. Every individual has the potential and responsibility to contribute. Each individual is responsible for his/her choices. Respect of self and others is essential to any community. Any community is enriched by its diversity and strengthened by its ability to unite for a common cause. Creativity and perseverance lead to success. Learning how to learn in a changing world is an essential life-long process. Integrity is vital for community to thrive. 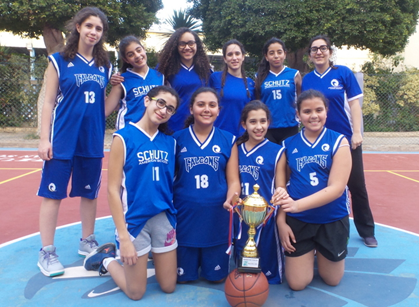 Schutz American School is situated in a residential neighborhood in northeast Alexandria. 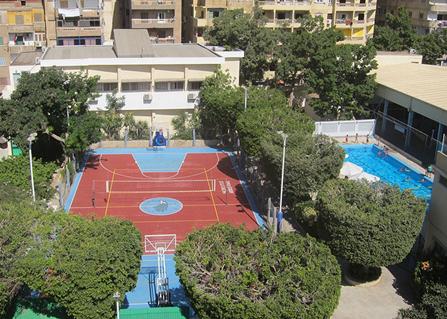 The school is surrounded by high-rise apartment buildings and is located just six blocks from the Mediterranean Sea, the Four Seasons Hotel and the San Stefano Mall. The 3.5 acre gated campus includes two classroom buildings, an auditorium-theater/classroom complex, administrative center, resident staff housing, art classroom/studio, two libraries, two computer labs, and a health clinic. 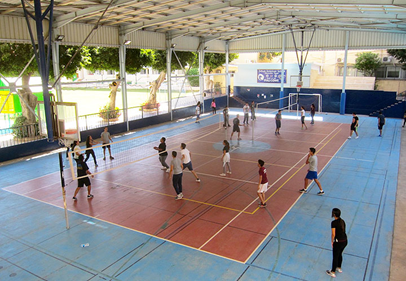 Sports facilities include lighted basketball, volleyball, and covered tennis courts, a swimming pool, exercise and weight-training rooms, a soccer field and two elementary playgrounds. The academic year is 175 to 180 instructional days running from late August to mid-June with fall, winter, and spring breaks. Classes are held five days a week (Sunday through Thursday). The school year is divided into four quarters and two semesters for middle and high schools and three trimesters for the elementary school. Parent/teacher conferences are held twice a year, report cards are prepared for each grading period, and parents have access to regular progress reports for their children via the ParentPortal web site. The program is a US general academic, college preparatory curriculum with numerous Advanced Placement (AP) Classes offered at the High School level. English is the language of instruction. Arabic (classic and colloquial) and French are offered as foreign languages starting in the Middle School. 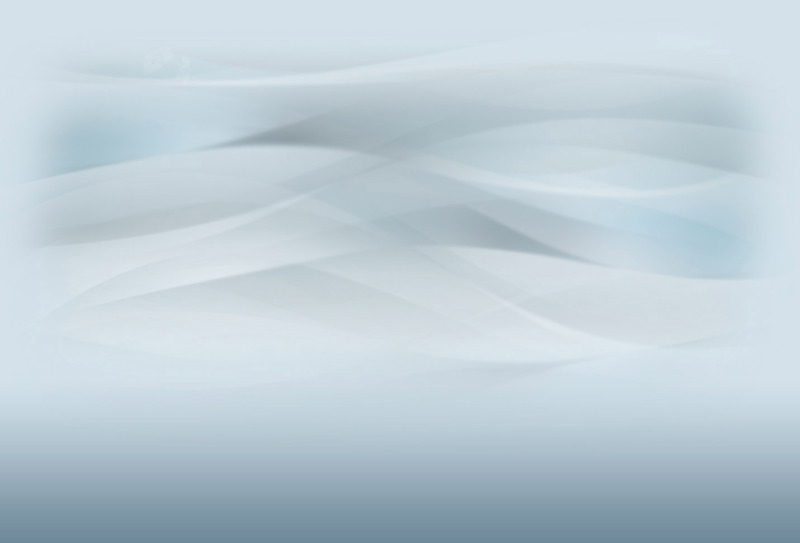 Schutz admits any student for whom it can offer a beneficial and valid program. Lack of proficiency in English does not preclude admission for expatriate children; however, there is limited support for non- native English speakers. The school may offer admission to students with learning or physical disabilities who demonstrate the ability to access and benefit from the regular classroom program and curriculum. Schutz is working hard to bring world class digital literacy skills to our students. The school is committed to this and has made recent significant investments setting the stage for improvement. 2014-15 brought significant investments into the stabilization of the school's infrastructure with a quadrupling of internet connection speed, an enterprise quality Ruckus Wireless infrastructure, and a move to the Google Apps for Education (GAFE) platform. 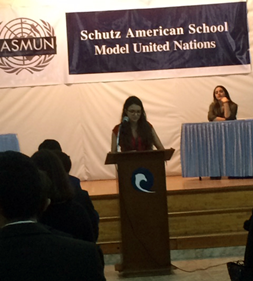 Schutz is the first and only school in Egypt to use Chromebooks in a 1:1 environment. In 2015-16 the school launched a 1:1 computing program at the Middle School with a school supplied Chromebook for every student. This year (2016-17) the 1:1 program was expanded to the High School and four Chromebook carts were introduced in the Elementary School with a ratio of one device per two students. Students grades K-5 attend weekly computer classes and the High School offers the AP Computer Science class, CS50, which covers web design and coding. The school currently employs 44 full-time teachers and four part-time teachers. The teaching staff consists mainly of Americans (63%) in addition to other international (12%) and Egyptian (25%) professionals. Currently, 69% of foreign teachers hold advanced degrees. There are also two IT & media staff, a school nurse, three secretaries, 20 custodial personnel, 9 maintenance staff, 10 food service staff, and 20 security personnel and 4 transportation staff. The Head of School is responsible for the day-to-day management of the school. An Assistant Head of School/High School Principal, Elementary/Middle School Principal, Finance Manager, and Operations Manager comprise the senior management team of the school. The school also has Directors of Learning & Information Technology, Curriculum & Instruction, and Athletics & Activities as well as a School-wide Librarian and a Counselor. 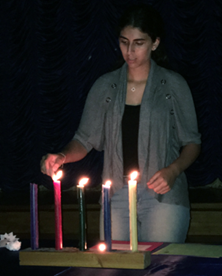 Our students represent 15 countries with approximately 10% expat, 30% dual nationally, and 60% Egyptian students. Co-curricular activities include yearbook/journalism, music, drama, community service, national honor society, and student council. Schutz American School participates in both the Eastern Mediterranean Activities Council (EMAC) and the International Schools Activities Conference (ISAC), which organize interscholastic events. Schutz traditionally fields sports teams for JV and Varsity in Volleyball, Basketball, and Soccer. In addition, through ISAC there are Academic games and Fine Arts events. Annually, the school has a Fall Carnival, International Day, Winter Festival, Sports Day, and a talent show. Fine Arts Evenings are held quarterly. The school has an active PTA, which sponsors an annual bingo night, auction and dance, play day, senior lunch, staff appreciation lunch, and workers’ Iftar. Schutz inaugurated its first Annual Fundraising Gala in 2007. Our foreign teachers are under contract with the American Schools of Alexandria Foundation (USAF). This U.S. based not-for-profit corporation exists to facilitate the legal and technical aspects of staffing Schutz American School. All financial and personnel benefits of the ASAF staff are handled for Schutz by International Schools Services (ISS) in Princeton, New Jersey. Members of the staff recruited from abroad live on campus. The school provides furnished apartments, daily meals, and housekeeping and laundry services so that staff can focus on their professional work in addition to enjoying personal time away from campus without restrictions. Our salaries are competitive and because the school takes care of all living expenses our teachers have a great saving potential. Our staff travels throughout the country and region without hindrance and often enjoy weekends at some of the best beaches in the world just a two-hour drive along the North Coast, in Cairo, or internationally at easily accessible locations such as southern Europe, Middle East or Sub-Sahara Africa. Schutz American School is a small international community and staff members are expected to contribute and participate in the on-going life of the school community, not just teach classes. Staff members provide leadership for extracurricular and social activities for the student body. These activities include sports, academic clubs, social events, school parties, class sponsors, PTA functions, and other similar activities. The reputation of Schutz as the premier American school in Alexandria. The reputation of Schutz for its multicultural, family atmosphere; a school where people take the extra step to go beyond basic education and help each other beyond the classroom. To preserve and honor the sense of history behind a school with over 90+ years of tradition carried forward into the 21st century. The student-oriented nature of Schutz, informal, supportive school climate underlain by high expectations. The involvement of Schutz students and staff in community service. Continuing to attract, develop, and retain quality staff. Enhancing community confidence in Schutz by promoting and upholding academic excellence across the school. Preserving the school ethos given a current majority host-country student body. Implementing the school’s master facilities plan to revitalize the school campus. Completing the final stages of the current Strategic Plan and leading the school in the development of a new plan. Operating the school within an uncertain business climate and increasing competition while maintaining financial stability. Completing the 5-year review of the NEASC/CIC Accreditation process. What makes a teaching couple stay at Schutz for 34 years? Or, a former Head for 29 years? While these are extreme examples (most teachers stay for much shorter terms, of course), Schutz has an ethos which is well known throughout the Middle East. To preserve it, the school seeks an experienced and compassionate leader, a proactive decision maker who inspires trust and confidence with all members of the school community. This is especially important as the school embarks on a campus revitalization project as well as considers a move to a new campus. Although the preferred citizenship of candidates is either US or Canadian, other nationalities may also be considered. Candidates who have previous head of school/director experience in a school outside the USA are also preferred. The board is seeking a dynamic individual with a strong academic background who is able to develop and articulate a clear educational vision for Schutz. He or she must be able to manage transitional change with minimal perturbation while embracing the Schutz core values, all the while working closely with the board and its committees. The new Head of School must be able to develop a strong management that is capable of facing change and to effectively move among different cultural groups with sensitivity. This requires well developed communication skills with individuals as well as with large groups. The community must feel comfortable in approaching the new Head, and an open, consultative style will facilitate communication. The new Head must personify integrity, and convey decisions decisively in a diplomatic manner. He/She will be expected to lead the school to higher levels of academic excellence. Salary and benefits will be competitive and consistent with the candidate’s experience and with similar positions at other schools of similar size in the region. In the interest of identifying the best candidates for this position the Schutz School Board has selected Search Associates to assist in this process. The deadline for applications is April 14, 2017. Candidates are asked to submit a letter of interest and the requested materials listed below as early as possible as the Search Committee reserves the right to close the selection process at any time if the right candidate is found. Semifinalist candidates will be identified by Search Associates and their dossiers forwarded to the Search Committee for review. On-line interviews will be arranged with the intention of completing the selection of finalists by the end of April, 2017 or before. The review of candidates will begin as soon as applications are received. The Search Committee will identify 2-3 finalists as early in the process as possible. Finalist candidates together with his/her spouse (if applicable) will be invited to visit the school in May and will meet with the Search Committee, Board, faculty, parents, students and all other constituent groups during the visit. The new Head of School will be selected after the conclusion of the site visit, final interviews, and reference checks. The new Head of School will begin in August 2018. A letter of application, explaining your strengths as a candidate and why you are interested in the Head of School position at Schutz American School. A maximum of three letters of reference that may already be in your possession. The beginning date for the position has been moved to August of 2018 because the current Head of School will remain for the 2017-18 academic year. Experienced school leaders who enjoy small schools should find Schutz an attractive career choice, especially given the school’s proud tradition, family ethos, and commitment to excellence. I first came to know Schutz thirty-five years ago, when George Meloy was already an institution there (he would stay for 29 years) and I was a young principal at Cairo American College. When he retired in 1990, he was described as a simple man with a humility rarely seen, simple in the sense of believing that all children can learn, regardless of how long it takes. George was also described as a man who ran the school with his heart. Andre Acimen, presently a distinguished professor at the Graduate Center of City University of New York, concluded an essay he wrote about his time as a student at Schutz in the sixties with this: "What luck!" said my father, comparing Schutz to his bleak French school in Constantinople. "So simple, so broadminded, and so modern, puts everyone to shame." Americans, he had decided, were perfect. Simple, broadminded, modern – a place run from the heart where all children can learn: not a bad legacy for a new Head to keep alive. My hope, as consultant, is that the next Head at Schutz will build their own legacy over several years, not for themselves, but for students and community served.